Back in 2013, I picked up a '78 with the idea that I would restore it as my first retirement project. Some of you may have followed my build on other forums. Loading it on the trailer, I noticed the kickstart quadrant on the back of the motor and knew that a true restoration was out of the question.Turns out it is a '75 engine. When I got it in the garage and started tear-down, many other surprises were in store. A heavy rust line through the belt guard are indicating the engine had spent a long time under water. Rusty cylinder walls in #2 & 4 along with pitted valves and seats. Kreemed tank with the coating over the pickup screen, but not fully lining the tank. BOTH (at least consistent) ends of the drive shaft had internal snap rings in their grooves. The rear grease seal had been removed and the entire swingarm pumped full of grease. U joint was shot. Lots of other normal setting too long problems of course. I piddled on it until retirement last year, then began in earnest. Ended up painting the tins twice because I was not happy with the first outcome. In the end, the only work that I did not do myself is grinding valve stems ($10 and 10 minutes at a small nearby automotive machine shop) and stitching/mounting the upholstery. I'm pretty pleased with how she turned out. This past weekend I shook of the winter blues by taking her to the Knoxville Cabin Fever show where she won 1st place in Hondas (admittedly, there were only three). Gonna drop some photos here if it works out. First ones are when she came home and some of the fun discovered, followed by a shot at the show. After fixing a pinched o-ring in #2 carb, she is running great! Kind of hesitant to ride her much this year, as I plan to enter a show almost weekly with her this year as a fun thing to do. I'm sure that will grow old and next year I'll want to ride her much more, and it looks like she will be great for it. Maybe ride her to a few shows. This past winter I primarily rescued a '79 CB750F to keep busy. With no intention of attempting to restore it, I left the appearance the same - a bike that had been left in the East Tennessee environment since at least 1999 (had tires on it old enough to vote). Also had suffered from very poor judgement by previous owner/mechanics that change front forks to leading axle 36mm forks (in 35 mm triples) that gave ~3" trail or less, Bondo everywhere, broken cam caps, valve clearances all over the map.I gave her a GL1000 front end. Of course, the tach and speedo needed restored, the carbs (very similar to GL1000 CVs) rebuilt and cleaned, tank cleaned and de-rusted, all but caliper bodies replaced in the brakes systems, replaced coils. Very similar to the work that I had to do on the GL1000. But, I did nothing for the appearance (actually, I did chisel .6" of Bondo off the tank and 3 pounds out from under the seat cowl, replacing that with glued-up ABS from a wrecked GL1800). A true rat-bike! 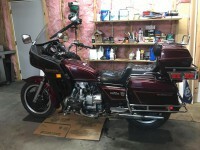 Now that she is finished she is up for sale so that I can pick up what I'd like to do next - a 1979 GL1000. Why? I just don't see many. Don't know production figures, but I know that sales were off as the 1980 GL1100 was being anticipated.